I'm tasked with redoing part of the UI in one of our desktop applications. I've specifically been asked to replace a "Load" button with an icon. Are there any conventions for this style of icon? Unfortunately, it's not a straightforward "open file" button, so the standard Windows icon won't work here (and would be confusing, as one of those icons already exists in the same space). The load button (pictured above) shows a dialog to the user prompting for a source, then loads a list of things from the datasource (either a database or a file of some sort) into the combobox to its right (which then becomes active). The button can be clicked again, allowing the user to re-load different information into the combobox. We were thinking of perhaps going with the recycle icon, but that isn't intuitive in terms of communicating that it also functions as the initial load (as well as reload). We were also considering some sort of arrow, but we're not sure how well that would represent "loading". One thing to note is that the button could be relocated to the right side of the combobox if that is a better design. The UI contains multiple instances of this button-combobox pattern. And also, just to clarify: this is a desktop app, so no uploading is required (the file / database is already on disk). [EDIT] If there is no convention for the load icon, what would you suggest? The user clicks Load. 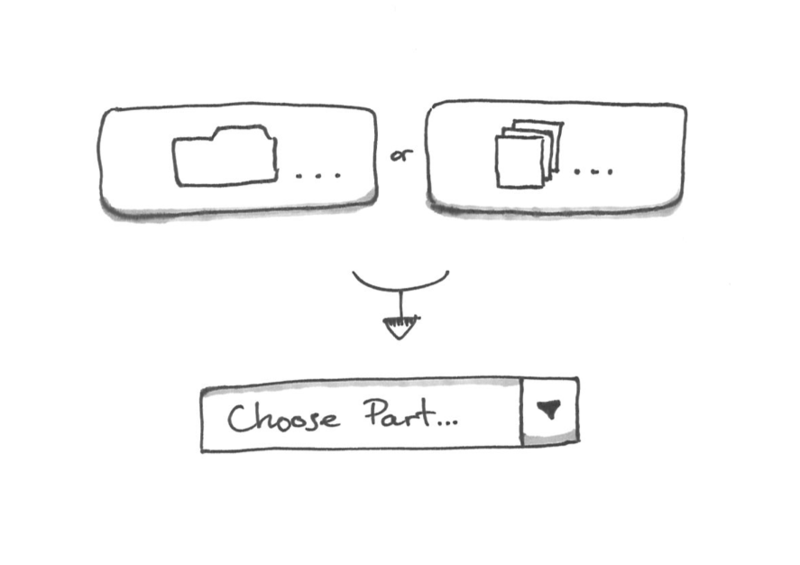 A dialog opens, asking the user for details about the datasource from which to load (database, file, etc.). When the user clicks OK on the dialog box, the program reads the data from the source and populates the combobox. For more information about how the combobox is used, see my other recent question. The idea being that pressing the button/symbol is all about loading or instantiating the combobox with something. Icon would be a bad choice for such a workflow because "loading" is a process that doesn't evoke a clear universal visual association. In addition, the button calls a dialogue window so it has to indicate that, which is currently conventionally accomplished with ellipsis. I would rather focus on the word choice for the label (Load/Source/Load Source/Add Source/List Source) to make sure users understand what they are loading exactly. Right now, your button says "Load...", you could try just using "..." instead of the text. The recycle, or refresh icon would work, too. But that's based on a requirement that you have to have the button or icon there. I would prefer to just get rid of the button entirely, enable the dropdown box, and when the user clicks the dropdown button or enters the control, go fetch the data. If it takes more than a few milliseconds, display a "loading..." text in the control until it's all there. Your "Load..." convention sounds like it could also be replaced with the standard exclamation point, which basically means "run", or since the user is selecting criteria for data, it's almost like a "filter". Tricky because as you said this isnt something that is standardisered. Therefore using only an icon and no label makes it harder for the user to figure it what it does out, by just looking at it for a second. But I think of the Open file icon. That is actually what the user does even if its all take place inside the application. Not the answer you're looking for? Browse other questions tagged buttons icons desktop-application or ask your own question. Combine load and save button into one button?